While much remains unknown about Alzheimer’s disease and its numerous effects on the brain, finding ways to reach patients who are in the throes of the disease and temporarily relieve their distress is a challenge to therapists and caregivers. What makes one patient become agitated to the point of screaming might be soothing to another. The most unlikely action, tone of voice or familiar behavior might help a caregiver calm a scared loved one or inadvertently set them off. One of the methods being used by Conway Regional’s Senior Behavioral Health program to calm agitated patients takes them back to childhood play. Playing with baby dolls opened up a world of adventure to many children. Now, in some instances, it can help to briefly relieve the distress experienced by dementia patients. “It provides a comfort to some of our patients,” said Donna Beshears, an activity therapist in Conway Regional’s Senior Behavioral Health. The geropsychiatric unit provides short-term, inpatient evaluation and care for patients who are diagnosed with certain forms of dementia, including Alzheimer’s disease. 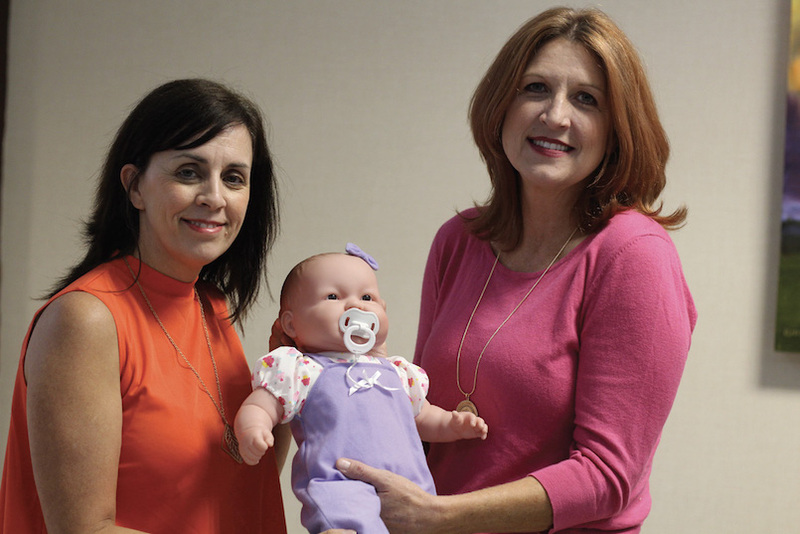 While she said the effects of the baby dolls must be evaluated on an individual basis, Beshears has found that they can provide a distraction for patients who are going through moderate to severe stages of dementia. Donna Beshears (left), activity therapist with Conway Regional’s Senior Behavioral Health, accepts a baby doll to be used for therapy from Tammy Smith with Abundant Amity Care. Smith’s organization has been donating the baby dolls and fidget blankets, which are used to help relieve anxiety among the male patients, to Conway Regional’s Senior Behavioral Health through a program called “Timeless Guys and Dolls.” The fidget blankets have keys, shirts, toy cars and other items sewn into them to draw the attention of the male patients. The blankets are placed on a desk during therapy sessions. Smith said Abundant Amity Care has donated about 100 baby dolls and 30 blankets to skilled healthcare facilities that care for Alzheimer’s patients, including hospitals and nursing home facilities. The organization depends on donations from churches and other organizations to provide the dolls. “We want to reach all the disciplines that touch patients,” she said. Smith left a financially stable career with International Paper about 15 years ago because she was drawn to providing care for senior adults. That move eventually led to the founding of the personal care agency. “Sometimes you just have to follow your heart,” said Smith. Doll therapy can be used in a variety of settings. It’s not just for persons living in Memory Care Centers. Doll therapy can help alleviate the anxiety of a person living with Alzheimer’s disease and provide a caregiver with a few minutes or hours of respite, according to Elise Hensley, outreach director for Alzheimer’s Arkansas, a statewide, not-for-profit caregiver support organization. “We strive to meet the needs of the caregiver where the caregiver is even if that means for just a few moments of respite (a break),” said Hensley. Not all caregivers agree that doll therapy is helpful, which is why Beshears recommends taking a careful approach toward introducing them into the lives of each individual senior patient. Communicate the purpose of the doll to everyone else who may be providing care. Do not force a doll on any senior, allow them to approach, hold and be stimulated by the doll on their own. Do not call the doll a doll. Remember, the senior may view the doll as an actual baby. Do not purchase a doll that loudly cries out as that could be upsetting. According to a National Institute of Health study in 2014, Doll Therapy was adopted from Bowlby’s Theory of Attachment and that human beings are pre-disposed to form attachments with others to survive in the world.